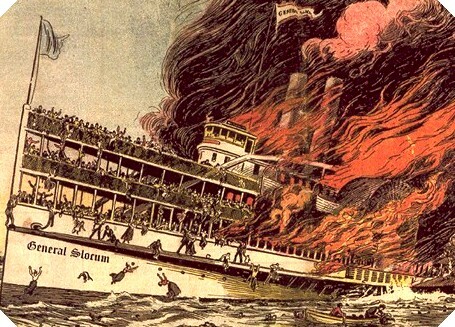 Remembering a tragedy: The steamboat General Slocum. “Ship Ablaze” cover illustration. Courtesy of The Mariners' Museum, Newport News, Virginia. When the twin-paddlewheel steamboat General Slocum departed Manhattan for Long Island Sound on the morning of Wednesday June 15, 1904, the 1,300-plus passengers on board expected nothing more than a relaxing day trip. The itinerary called for a short ride up the East River to Long Island's Locust Grove, where the travelers would eat, drink and play to their heart's content before being ferried back home. It's safe to say that swimming was not one of the planned activities, as the mini-cruise called for participants to wear their Sunday best, and few early 20th century New Yorkers knew how to swim, anyway. But just minutes into the excursion a fire started below deck, and before long flames engulfed the boat, forcing the passengers into the water. In the book, “Ship Ablaze” (Broadway), historian Edward O'Donnell recounts the General Slocum story, a tragedy that took the lives of 1,021 people—mostly women and children. Initially, the fire and subsequent horrors were viewed as a simple, albeit catastrophic, accident. But when survivors reported the alarming disrepair of the boat's safety equipment, it became evident that corporate greed, corruption and negligence were to blame for the casualties. Within a week, grand jury hearings were underway to determine culpability, but the victims' families would get no satisfaction. The decisions and actions that led to the second-deadliest incident in New York's history went almost entirely unpunished. When put into service in 1891 the General Slocum was one of the largest and most luxurious steamboats in and around New York. 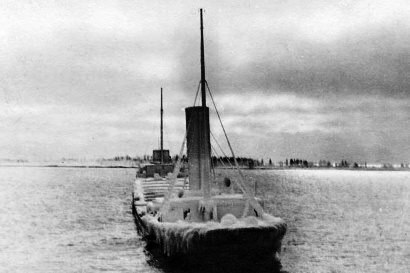 Named after Major General Henry Warner Slocum (1827-94) she was 264 feet long, weighed 1,300 tons and could carry 2,500 passengers. By the turn of the century, however, newer steamers had surpassed the General Slocum in terms of speed, size and comfort, and it came to be regarded as a second-class boat. As such, the middle- and working-class members of St. Mark's Lutheran Church on the Lower East Side were able to charter her for their annual church outing at a cost of $350. Shortly after pulling away from the pier a fire was discovered in the ship's lamp room—a utility room where the crew stored equipment and supplies. The exact cause of the fire remains unknown, but a careless member of the crew was likely responsible. "Somebody, either in the striking of a match or the extinguishing of a match sent a spark that ignited the hay on the floor. It burned very slowly until somebody noticed the smoke once the ship was underway,” relates O'Donnell. Ironically, less than a year earlier, Schaick had received a medal from the Association of Masters, Mates and Pilots for being the safest, most experienced captain—the equivalent of a lifetime achievement award. But in this case, his confidence and years of experience may have worked against him. "You can become complacent and arrogant. Your success actually sets you up for failure because you've done something so well for so long—who's going to tell you how to do it any differently?” asks O'Donnell. Naturally, the sight of the blazing General Slocum caught the attention of other boats, many of which began following in the Slocum's wake, hoping to rescue passengers. Meanwhile, an office worker in Manhattan phoned an editor for the New York World, providing an eyewitness account of events. "The guy called and said, 'I'm in an office overlooking the East River. There's a steamboat on fire . . . Oh, God! Women and children are leaping over the railing by the dozens . . . This is ghastly, horrible….’” relates O'Donnell. As a result, the World scooped all the other dailies in New York City and within an hour had thousands of Extra! newspapers on the streets with news of the disaster. To make matters worse, when Schaick finally beached the boat at North Brother Island he found he couldn't get in as close as he wanted. "He caught a rock and people on the stern were actually in water that was substantially over their head,” says O'Donnell. For people who didn't know how to swim the water might as well have been a thousand feet deep. The first newspaper accounts of the disaster were largely matter-of-fact. "But as soon as survivors began to talk and present a pretty consistent view of what happened the condemnation came . . . the owner of the steamboat was guilty of criminal negligence and greed," says O'Donnell. But before long Barnaby changed tactics and began pointing a finger at the USSIS. "He realized that they had received a clean bill of health from a federally approved inspector and could hide behind that,” states O'Donnell. In the immediate aftermath it appeared just a few hundred individuals had perished, but when the tide changed bodies began to surface and the magnitude of the disaster was realized. On North Brother Island, survivors received treatment while corpses were lined up in rows to await identification. No One Is To Blame? In contrast to the tortoise-like pace of today's legal system grand jury hearings began almost immediately. "The fire took place on a Wednesday and that Monday hearings were convened in the Bronx,” notes O'Donnell. 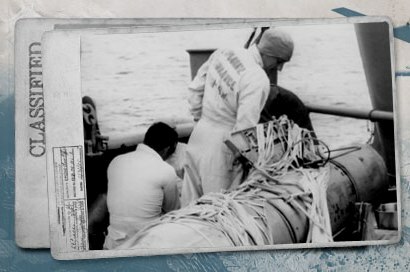 Meanwhile, an investigation of the physical evidence also got underway, and divers were commissioned to collect incriminating evidence from the wreck, including unused fire hoses and life jackets. Ultimately, Barnaby's strategy to hide behind the USSIS paid off. "The inspector was tried three times and freed after three consecutive mistrials,” advises O'Donnell. "With his non-conviction there is no case against Knickerbocker Steamboat officials.” Soon afterwards Barnaby would sell off his ships, dissolve the company and emerge virtually unscathed. However, as commander of the vessel, Captain Van Schaick was still vulnerable to legal action. 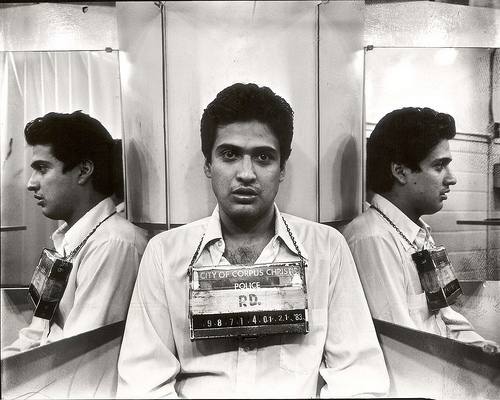 "Two years after the fire he is tried and convicted of manslaughter and sentenced to ten years of hard labor at Sing Sing prison in upstate New York,” says O'Donnell. "He called himself a scapegoat and many people believed it, so much so that his wife conducted a relentless letter campaign and got president Taft to pardon him after three years.” Not surprisingly, survivors and relatives of victims were outraged that the only individual being punished for the disaster was freed after serving less than a third of his sentence. In the end, the General Slocum was salvaged, bought at auction, and converted into a coal barge, sailing for seven more years before sinking off the coast of Atlantic City, New Jersey. Meanwhile, the tragedy began to fade from the country's memory, especially after New York's Triangle Shirtwaist fire in 1911 and the sinking of the Titanic in 1912. Great Lakes Storm of 1913—Michael Schumacher, author of “November’s Fury,” on the white hurricane that pounded the Great Lakes in November 1913.